Market Capitalization According to NASSCOM the revenue from information technology sector has risen from 1.2 % of the GDP in 1997-98 to 5.8 % of GDP in 2008-09. Indian Information Technology industry is one of the fastest growing industries in the country. The IT industry has built very valuable brand equity for itself in the global markets. The Indian IT Industry comprises of software industry and information technology enabled services (ITES), which even includes business process outsourcing (BPO) industry. Indian IT Industry is considered as a pioneer in software development and a favorite destination for IT-enabled services. In the year 1974, the origin of IT industry in India can be traced, when the mainframe manufacturer, Burroughs asked its India sales agent, Tata Consultancy Services (TCS) to export programmers for installing system software for a U.S. client. 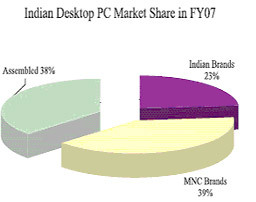 The Indian IT industry originated under very unfavorable conditions. During olden times local markets were absent and government policy toward private enterprise was hostile. 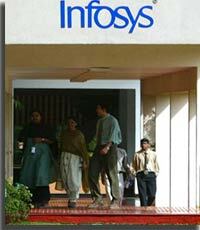 The Indian IT Industry was begun by Bombay-based conglomerates who entered the business by supplying programmers to global IT firms located overseas. During 1970's the Indian economy was state-controlled and remained hostile to the software industry. Even the Import tariffs were high like 135% on hardware and 100% on software. Even the exporters were ineligible for bank finance. In 1984 Rajiv Gandhi became Prime Minister and the Government policy towards IT sector changed. The New Computer Policy (NCP-1984) consisted of a package of reduced import tariffs on hardware and software which reduced to 60%. Even during this time the recognition of software exports as a "delicensed industry", was done so that banks were eligible for finance and freed from license-permit raj, there was even the permission for foreign firms to set up wholly-owned subsidaries. All such policies are reasons for the the development of a world-class Indian IT industry. Today, IT companies in India such as Tata Consultancy Services (TCS), Wipro, Infosys, HCL are well known in the global market for their IT competency. Indian IT Industry's development and contribution to the world's information technology sector is of highest reputation. Metro Cities like Bangalore, Mumbai, Delhi, Chennai and Hyderabad have become the favorite destinations for all the big banners like HSBC, Dell, Microsoft, GE, Hewlett Packard, and several Indian multi national firms like Infosys Technologies, Wipro, and Micro land have set up their offices in these cities. As the cities offers good infrastructure, with large floor space and great telecom facilities. This could be reason for the basis of the high growth statistics of India and the changing outlook of the companies towards India. The Indian IT Industry has grown up to US $ 5.7 billion in 1999-2000, with the annual growth rate not sliding below 50 % since 1991. IT Industry in the country has played a major role in placing India on the international map. The Indian IT Industry mainly comprises of instance System Integration, Software experiments, Custom Application Development and Maintenance (CADM), network services and IT Solutions. According to the analysis done by the annual report 2009-10, prepared by the Department of Information Technology (DIT), the IT-BPO industry was expected to achieve a revenue aggregate of US$ 73.1 billion in 2009-10 as compared to US$ 69.4 billion in 2008-09, growing at a rate of over 5 %. 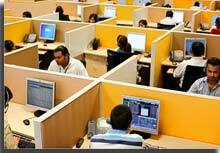 The report even predicts that the Indian IT-BPO revenues may reach US$ 225 billion in 2020. According to Nasscom's analysis in the fiscal year 2009 Indian IT-BPO industry expanded by 12% and gained aggregate returns of US$ 71.6 billion. Out of which the derived revenue US$ 59.6 billion was earned by only the software and services division. Further, the industry witnessed an increase of around US$ 7 million in FY 2008-09. Today in India the data centre services market is forecasted to grow at a compound annual growth rate (CAGR) of 22.7 % between 2009 and 2011, and to touch close to US$ 2.2 billion by the end of 2011, according to research firm IDC India's report published in 2010. According to the report of Internet and Mobile Association of India (IAMAI) and market research firm IMRB, the total number of Internet users in India reached 71 million in 2009. The active users were 52 million in September 2009 when compared to 42 million in September 2008, registering a growth of 19 % year-on-year, stated the report. Indian Information Technology industry contributes 5.9% of the country's GDP while providing employment to a significant number of its tertiary sector workforce. In March 2009, annual revenues from outsourcing operations in India was up to US$ 60 billion and this is expected to increase to US$225 billion by the year 2020. The most prominent IT hub is IT capital Bangalore and the other emerging destinations are Chennai, Hyderabad, Mumbai, Pune, NCR, Jaipur and Kolkata. India's growing stature in the information Technology enabled the country to form close ties with both the United States of America and the European Union. According to Department of Information Technology, the Indian software and services exports was expected to reach US$ 49.7 billion in 2009-10 as compared to US$ 47.1 billion in 2008-09, with an increase of 5.5% in dollar terms. Further, the Indian IT Industry's services exports is estimated to grow from US$ 25.8 billion in 2008-09 to US$ 27.3 billion in 2009-10, with a growth of 5.8 %.In the year 2008-09, the domestic IT attained revenues worth US$ 24.3 billion as compared to US$ 23.1 billion in FY 2007-08, with a growth of 5.4%. The tremendous demand for IT services and goods by India Inc., has majorly strengthened with the expansion of the domestic market as agreements worth extraordinarily to US$ 100 million. Till 2012, the domestic sector is estimated to expand to US$ 1.7 billion against the existing US$ 1 billion. IT exports software and services of India are to nearly 95 countries around the world. As per a Confederation of Indian Industry (CII) report, the Indian IT industry is growing at an annual rate of 35%. National e-Governance Plan (NeGP): The Government of India plans to give high priority to improve the quality to the citizens by providing basic services at their doorstep for which it has formulated a NeGP covering 27 mission mode projects. State Wide Area Networks (SWANs): The Government has started a scheme for establishing SWANs across the country in 29 states with a total estimation of US$ 682.27 million over a period of five years. State Data Centres (SDCs): SDCs have been identified important for the core infrastructure of supporting e-Governance initiatives under NeGP. Common Service Centres (CSCs): The main objective of CSCs is to develop a platform that can enable Government, private and social sector organizations to carter their social and commercial goals for the benefit of the rural population in the country with a combination of IT-based as well as non-IT-based services. Community Information Centres (CIC): Government has initiated the CIC's in the hilly and far-flung rural areas of the country with main objective to bring the benefits of ICT to the people for the purpose of socio-economic development. Nanotechnology: Department of Information Technology started nanotechnology development programme during the 10th plan with the aim of creating infrastructure for research in nanoelectronics and nanometrology at the national level.